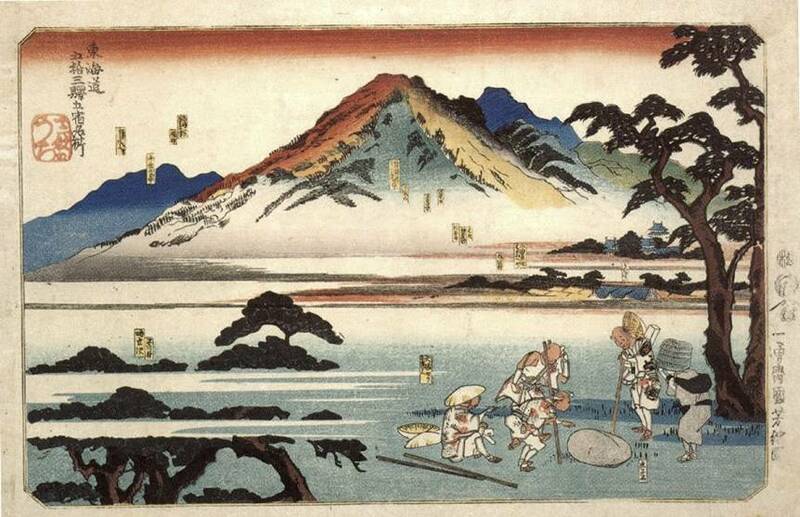 The Tôkaidô Road was the costal route connecting Edo (present day Tokyo) with Kyoto. (The inland route between Edo and Kyoto was the Kisokaidô Road). There were fifty-three rest stops along the Tôkaidô Road. The number of stations represented on each print varies from three to six. This series is unusual in that each print bears the crests of two different publishers in the right margin. The prints in this series are each about 10 by 14 inches (25 by 36 centimeters), a size known as ôban. Description: This print depicts four stations, each identified by a small label. The first is Nihonbashi (Nihon Bridge) shown at the lower left corner crowded with porters and travelers at early morning. The second station is the seaport of Shinagawa. Kawasaki is the crossing at the Rokugo River. 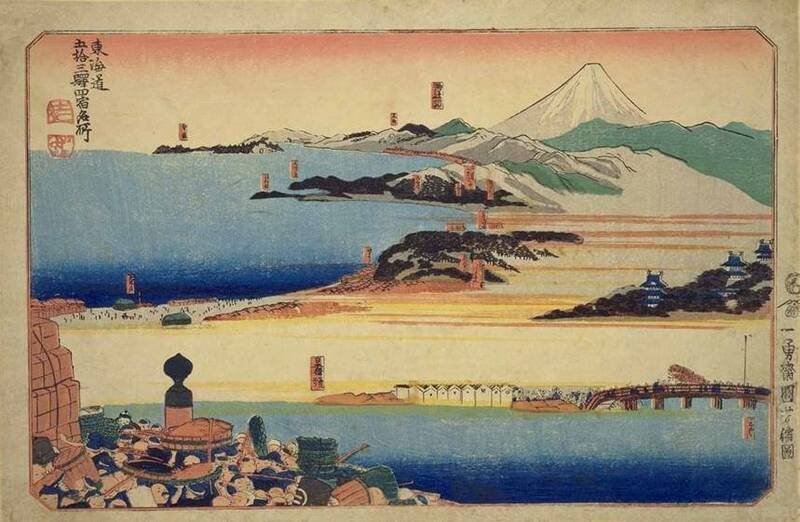 Kanagawa lies along the seacoast of Tokyo Bay with the ever present Mount Fuji in the distance. Description: Yellow labels placed throughout the abstract mountain ridge indicate Shinmachi Bridge at Hodogaya, Yoshida Bridge at Totsuka and Fujisawa Bridge. 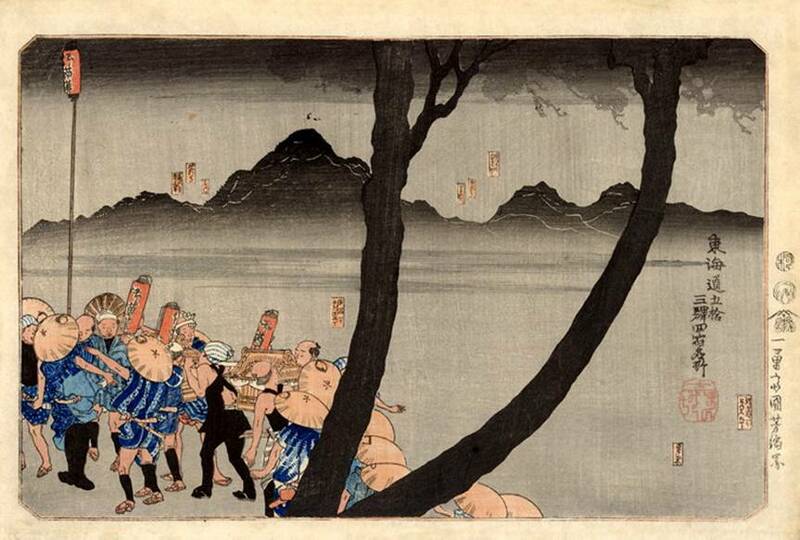 Kuniyoshi’s toshidama seal decorates the straw hats of the porters in the lower left. This is another example of the above design. 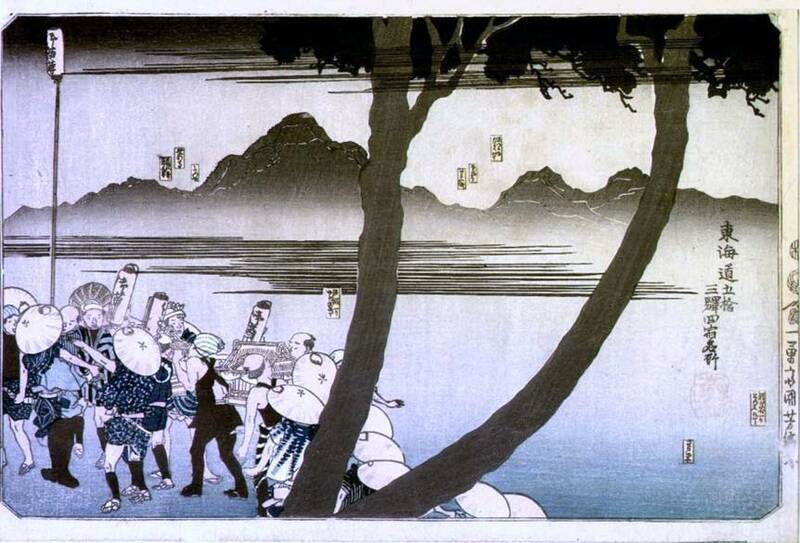 It was printed from the same woodblocks, but the printer applied more black ink to the sky and foreground in order to create a night scene. This is yet another variant of the same image kindly supplied by Richard Illing. 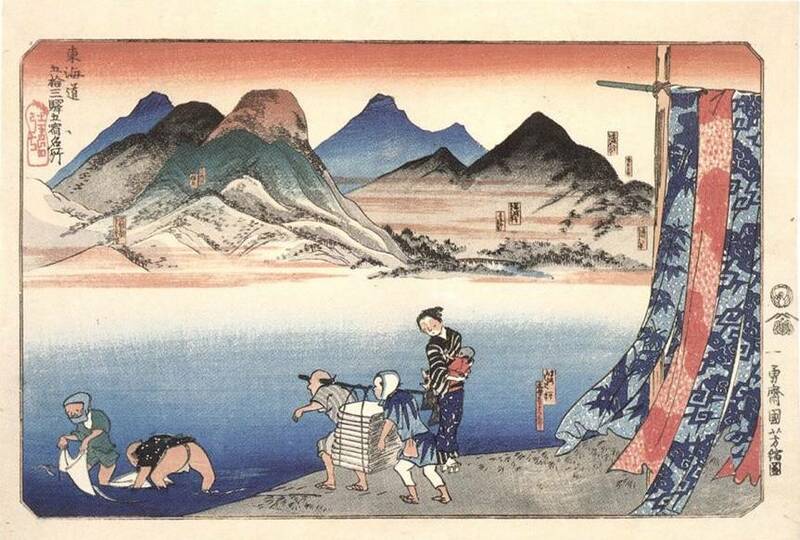 It has blue shading (bokashi) in the foreground, different mid-ground mists and different patterns on some of the garments. Description: Travelers marveling at the Koshiseki (also known as Tora’s Rock and Tiger Cub Rock). The mountains of Hakone are known for displaying a multitude of colors. 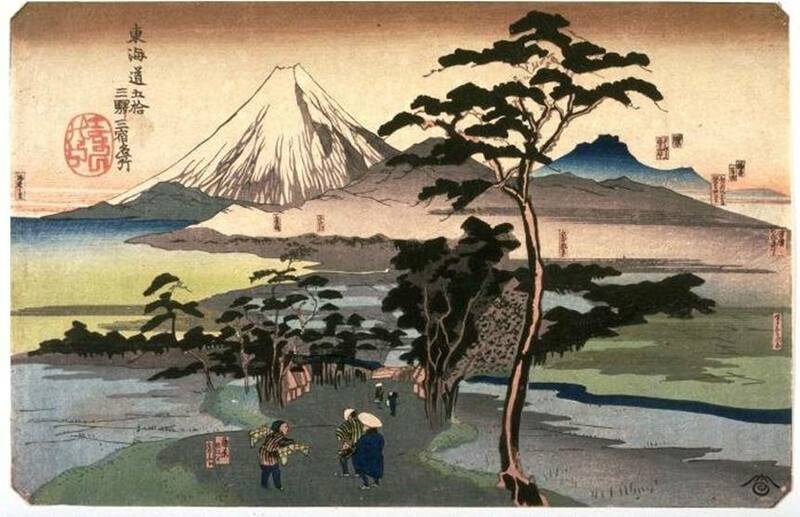 Description: This print shows travelers on a road heading towards Mount Fuji, which is covered with snow. Another state of the above design. The seal in the right-lower corner is probably a collector’s seal. 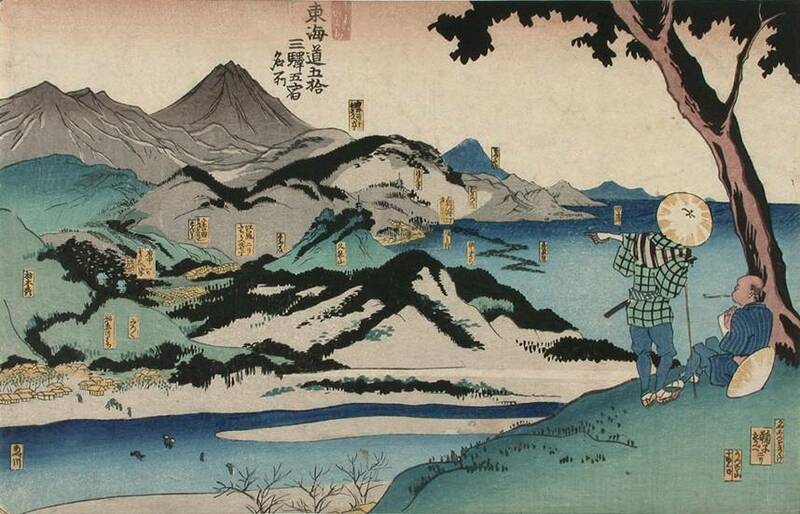 Description: In the foreground, two travelers rest on a hillside labeled Mariko and look out towards the seacoast towns of Fuchû and Ejiri. In the distance, a famous pine grove on Miho Beach is shown in the bay near Okitsu. 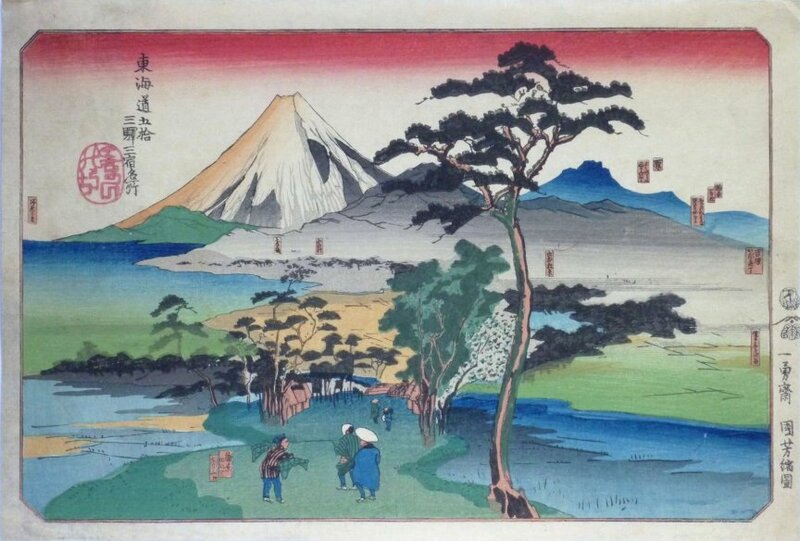 Yui, the fifth stop in this print, is indicated by a label. 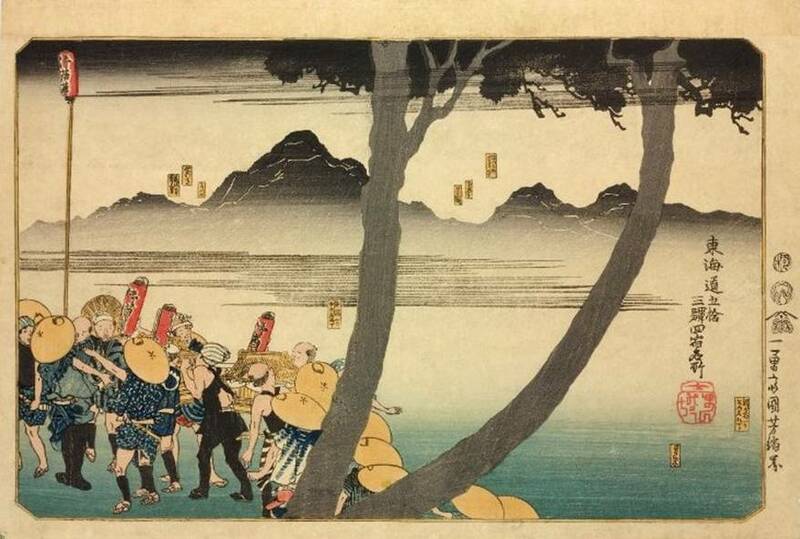 Description: Travelers who have just crossed the Ôi River from Shimada on the eastern shore to Kanaya on the west. 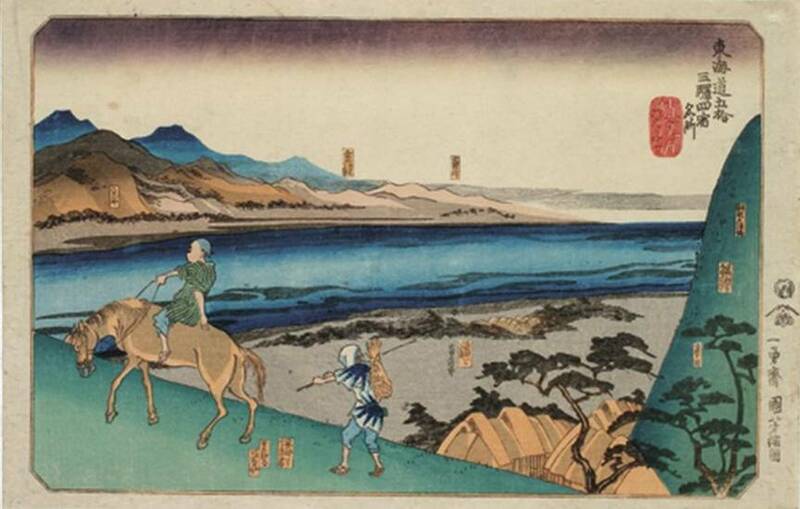 The steep incline at the right at Fujieda is juxtaposed with the angle of the road in the foreground where a traveler on horseback and his companion trudge uphill; the contrasting lines of these two hills frame the space of the distant shoreline. 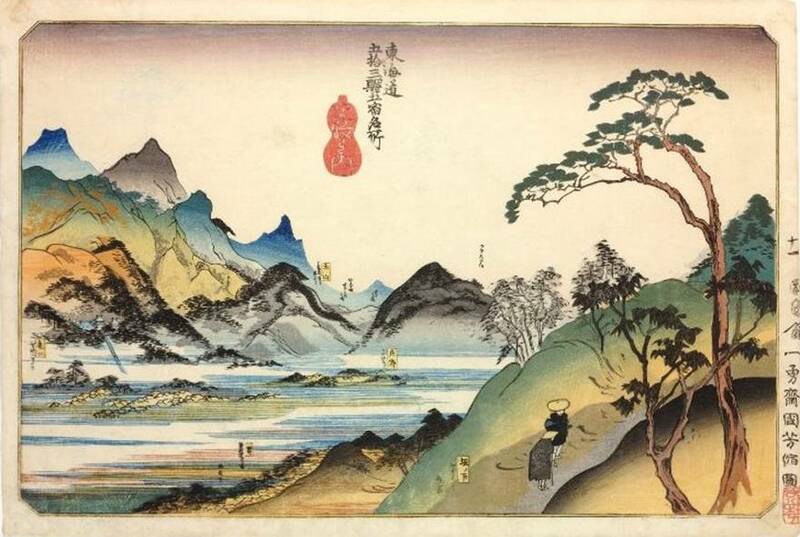 Description: This print is the closest in the series to being an uninhabited landscape, but travelers can be discerned as black dots on the mountains of Nissaka to the right. The blue circle in the right lower corner is a famous rock at Sayo Nakayama called Yonakiseki. A legend relates how this rock summoned Kannon (Buddhist goddess of mercy) when bandits murdered a pregnant woman there. The infant was saved and eventually avenged his mother’s death. Kakegawa, Fukuroi and Mitsuke are each shown as a cluster of huts in the mountainous region. Hamamatsu’s castle near the Tenryû River is indicated at the left. 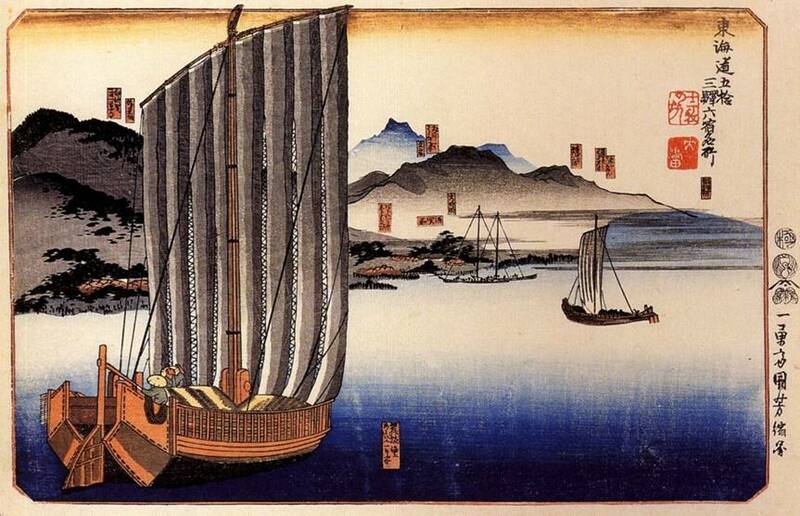 Description: The large sailboat in the foreground is a ferry that sails between Maisaka and Arai. 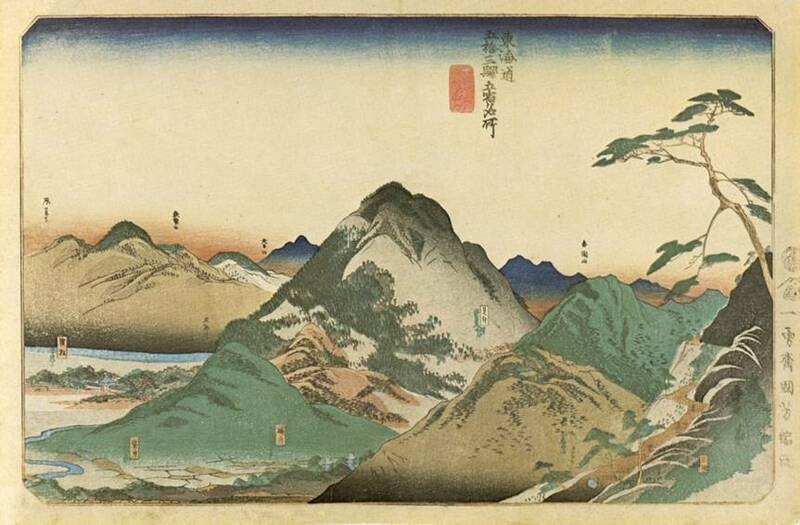 Shirasuka, Futakawa, Yoshida, and Goyû are indicated by labels along the distant mountains. Description: Kuniyoshi’s family were silk dyers, and Narumi was renowned for its stencil-dyed fabrics. Newly dyed fabrics are drying in the wind at right as workers carry bolts of cloth to the river to wash and prepare for dyeing. The landscape across the river shows the Yahagi trestle bridge at Okazaki, which was the longest bridge in Japan at the time. Akasaka, Fujikawa, and Chiryu Stations are indicated on the mountains in the distance. Description: Blind itinerant priests are entering the Atsuta Shinto Shrine in Miya, which is marked by a wooden tori at left. 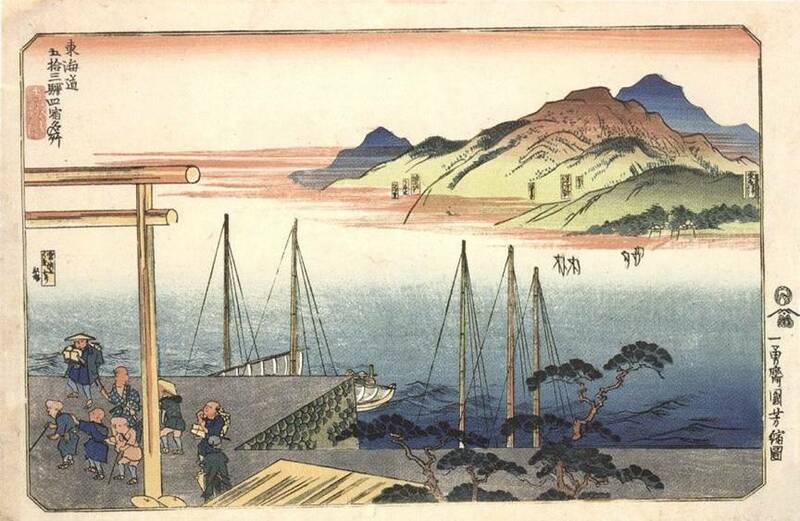 Kuwana Castle at the entrance to the port is shown across Ise Bay, with Yokkaichi and Ishiyakushi indicated by labels in the mountains farther to the left. 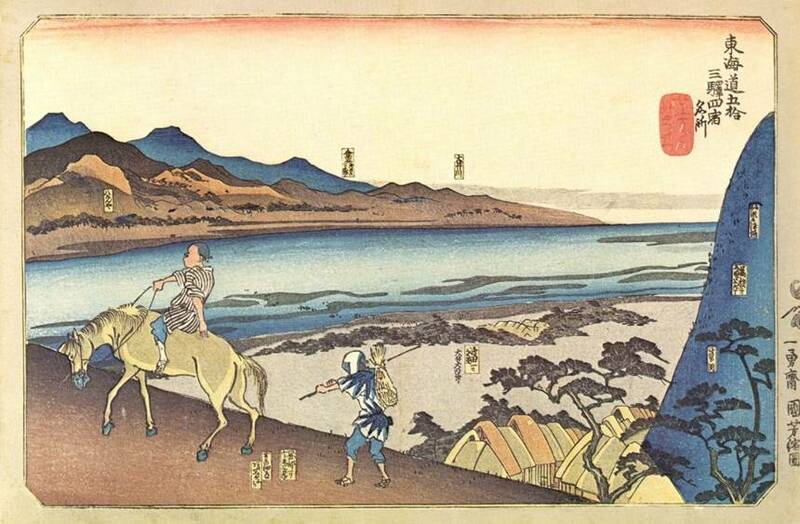 Description: Travelers are walking along the road from Mizuguchi to Ishibe past Lake Biwa towards Kyoto in the distance. A pilgrim is carrying a large long-nosed red mask on his back to the Kompira Shinto Shrine in Shikoku, where it will be used in ritual processions. This series of prints contains many seals and inscriptions. The small yellow rectangles indicate names of regions and noteworthy places. The following table lists other inscriptions and seals found in this series. 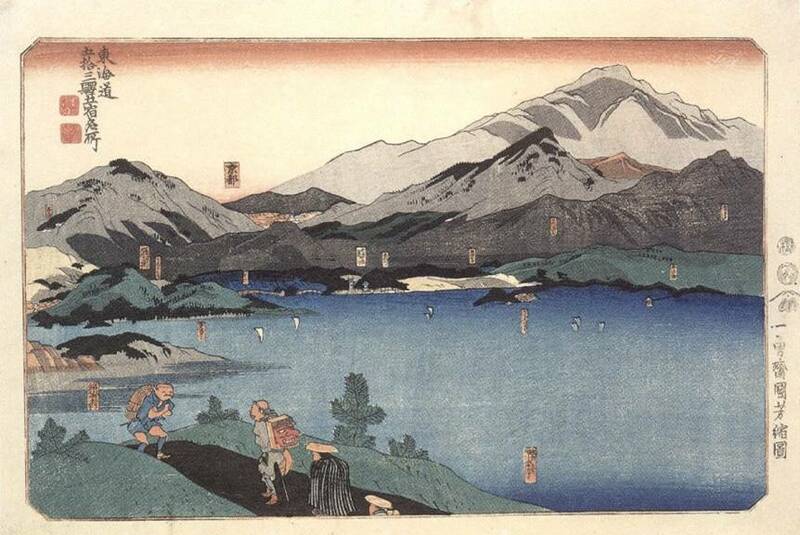 Famous Views of the Fifty-three Stations of the Tôkaidô, [Six] at a Time (Tôkaidô go-jû-san eki [roku shuku] meisho, 東海道五十三駅六宿名所). The character indicated by the arrow is the number of stations on that particular print. The rest of the text is the same on all of the prints. Ichiyûsai Kuniyoshi shuku ga (Ichiyûsai Kuniyoshi drew these stations). 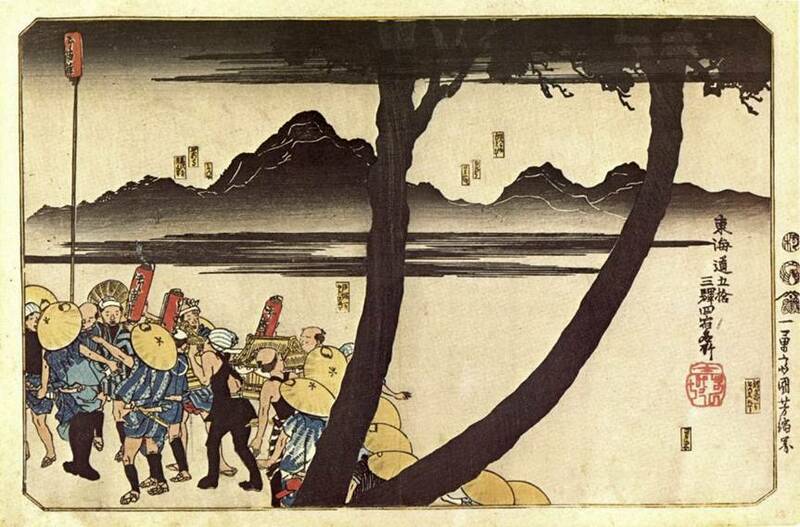 Although Kuniyoshi is now known as Utagawa Kuniyoshi, he also used the names Ichiyûsai Kuniyoshi, Chô-ô-rô Kuniyoshi, Igusa Kuniyoshi, Ichi Kuniyoshi and Saihôsa Kuniyoshi. These are some of Kuniyoshi’s many personal signature seals. “Schaap” refers to listing in Heroes and Ghosts: Japanese Prints by Kuniyosh by Robert Schaap (Hotei Publishing, Leiden, 1998).